The Moto Z Play is meant to play, as is made clear by its headphone jack and long-lasting battery – and everyone is invited thanks to its cheaper price. Just don't expect stellar performance from the chipset or camera on this thicker Moto Z variant. Update: The original Moto Z Play officially takes the back seat to the newer Moto Z2 Play in a few ways. First off, it's a whole millimeter thinner than the Z Play at just 5.9mm. Its rear-facing camera can shoot bigger pixels, resulting in photos of a generally higher quality. There is one notable downside here with the Z2 Play: the battery capacity has been downgraded in the Z2 Play's quest for thinness. The drop in millimeter has reduced its precious battery from 3,510mAh to 3,000mAh. While it's more or less just as capable as the Z Play, what sets it apart is its price. Currently, you can snag the Z2 Play for just about the same price as the original. For a slimmer device with a vastly improved fingerprint sensor that can use all of your Moto Mods, the Z2 Play is the better deal. That said, if you invested in the original, there's still plenty of reason to hang onto it. The biggest of which might very well be that Android Oreo is coming to the phone later this year. Moto Z Play is the slightly thicker, long-lasting and more affordable smartphone with creative modular accessories, and it's proof that Motorola is committed to the idea of a customizable phone. Coinciding with the Moto Z Play launch is a new mod: the Hasselblad True Zoom camera. This makes your Android phone look and feel like a real camera, with 10x zoom and physical controls. All of these MotoMods, new and old, work across the three modular Motorola phones, including the ultra-thin Moto Z and shatter-resistant Moto Z Force. The Moto Z Play isn't as flashy as the world's-thinnest-title-holding Moto Z, and it doesn't have the durable screen of the Verizon and US-exclusive Moto Z Force. It's also less powerful. What it does have is a bigger battery, a cheaper price and a headphone jack. You can charge via USB-Type C and play music over the normal 3.5mm jack here, unlike on the Z and Z Force. The Moto Z Play therefore fixes some of the gripes we had with the Moto Z, and opens modular smartphone accessories to a whole new audience looking for a cheaper phone. Let's see if it fits your needs. 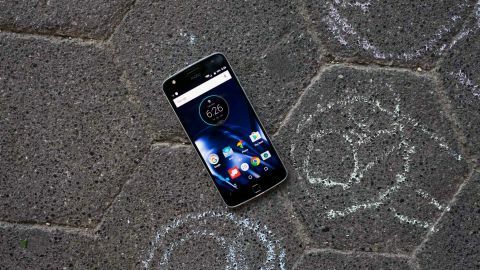 If you were interested in the Moto Z, but scoffed at its high price, then you'll like the savings that the mid-range-friendly Moto Z Play brings at launch. It costs $408 at full price when tied to Verizon, or $17 a month over 24 months through the carrier's device payment plan. Fully unlocked from Motorola, it costs $449 in the US or £369 in the UK. That contrasts with the Moto Z, which currently costs $624 at full price from Verizon, and $699 or £499 unlocked. The Moto Z Force is even more money at $720 without a binding contract, but it's still only available through Verizon. The Moto Z Play takes several cues from the flat design of its Moto Z counterparts, only it's noticeably thicker in the hand. It measures 156.4 x 76.4 x 6.99mm and weighs 165g. Even with the same 5.5-inch screen size and non-curved back, it feels bigger in one hand. It's still palmable on its own, until you magnetically attach accessories – then it can become a real monster. The good news is that its extra girth gives you the ability to listen to music and charge at the same time. It sounds crazy to list this as a pro, but missing headphone jacks are a common thing now. The iPhone 7 and iPhone 7 Plus famously don't include a 3.5mm headphone jack, and neither do the Z and Z Force. Motorola's instead sending audio over their USB-C ports on those phones, which requires an (included, but easy to lose) 3.5mm jack adapter. The other good news is that the Z Play has just about every other design feature we liked about the initial Moto Z line, including the small but incredibly convenient front fingerprint sensor. The fingerprint sensor takes up a lot of room and extends the phone's chin, but it works to our liking by both waking the phone and putting it to sleep with one touch. Being able to both lock and unlock the phone without having to hunt for the side sleep/wake button on the frame is a tremendous advantage for Motorola's new phone series. It's an especially big deal (for a bad reason) because the side power button is equidistant to the volume down and up buttons. It's easy to get it mixed up with their non-rocker volume button design. The Moto Z Play includes a water-repellent nano-coating, but it isn't waterproof like the Galaxy S7. It's just good enough to survive accidental spills, splashes or light rain, not full submersions. It also lacks the Moto Z Force's trademark feature: a shatterproof glass screen. Drop this one from the same five feet of height and you'll regret it. The Moto Z Play comes in a two of colors so far: black with a silver frame and fringe, and white with a gold frame and trim. The real variety comes with MotoMods. The Moto Z Play takes advantage of all existing MotoMods and they seamlessly snap onto the back of the phone using magnets. The only thing that can be cumbersome is it's suddenly thicker size. With the Power Pack battery accessory, for example, the phone suddenly feels almost three times bigger than when you started out. You may not need the battery pack considering the Moto Z Play's heftier battery size, thankfully. You will (and should) enjoy the back covers (called Style Shells, according to Motorola) because the Z Play has a reflective glass back and exposed 16 modular pins. They aren't nearly as appealing. The coolest mod is the Moto Z Insta-Share projector. It's a mini projector that shines your phone's screen anywhere you want at a size of 70 inches before distortion kicks in. This projector fits in a pocket (though barely, at size close to 70mm) and has an embedded kickstand for tilting and automatic keytoning. Focus can be adjusted manually via a side dial. The Insta-Share projector requires a dark or very dim room for its 50 lumens to be effective and, of course, it doesn't come cheap: it costs $299. Motorola and JBL turned the smartphone volume up to eleven with their SoundBoost creation. It turns the back of your phone into an even thicker frame, but one that becomes a powerful speaker. It's not as loud as a dedicated Bluetooth speaker, but it's almost as good. You won't feel the need to turn it up if it's just you and a small party. Best of all, there's a handy kickstand and it adds 10 hours of battery life. Looking for a Mophie case? Don't. MotoMod juice packs add 2,200mAh of battery life in exchange for a few millimeters to the thickness. Unlike the Z, the Moto Z Play can't really afford this extra girth. It comes in a variety of designs, including from designers like Kate Spade and luggage maker Tumi. It's really trying to combine style and functionality, and it's easier to clip on compared to a Mophie case. You don't have to buy a MotoMod right away to satisfyingly lock an accessory to the back of your new phone with magnetics. Moto Z comes with a Style Shield in the box. Wood, leather and plastic options are going to be available in the future, giving you some degree of customization over your ever-important handset, just like the Moto X series. Further out, there's a lot of potential for MotoMods. Motorola is opening up its platform to one and all with a $125 developer kit. Moto Z Play has a 5.5-inch Super AMOLED display, the same size and technology as the Moto Z and Z Force, but it brings the resolution and pixel count down. It's a 1080p Full HD screen with 403 pixel per inch instead of a 2K resolution. It doesn't look as stunning close up, but it's still beautiful and bright enough that you won't complain. Even with the resolution change, the Moto Z Play display keeps Motorola's Active Display intact. Wave your hand over the phone and it senses your presence with limited information – the time, date and notification icons – all of which requires barely any power. It's like the always-on screen used in new Samsung and LG phones, but one thing that's better is that the discrete notifications icons are interactive here. Tapping on a notification icon reveals more information, like the beginning of an email body. Flicking the icon up opens the message. Flicking it down dismisses it. Motorola scores major points with this minor touch.